Seward is a small port town on the southern coast of Alaska, tucked in a harbor on the Kenai Peninsula. Surrounded by glacial water and snow-capped mountains, it is a small town with a big presence and abundant beauty. 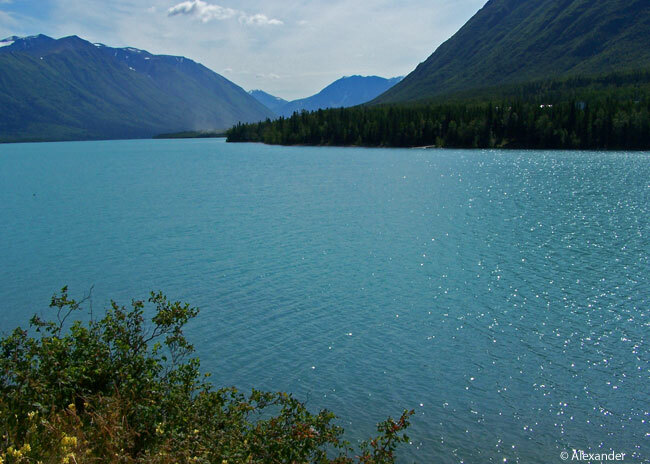 This town is the gateway to Kenai Fjords National Park. Situated on Resurrection Bay in the Gulf of Alaska, it offers many ways to explore the Harding Icefield and its nearly 40 glaciers that dominate this area. We took a half-day boat trip out of Seward and had the thrill of seeing a glacier from the boat. Occasionally a huge mass of blue glacial ice broke off (“calved”) and tumbled into the frigid waters below. There are only four remaining icefields in the U.S., the Harding Icefield in Seward is one, and covers 300 square miles (777 km2). There are 190 different species of birds here, and a plethora of land and sea mammals. 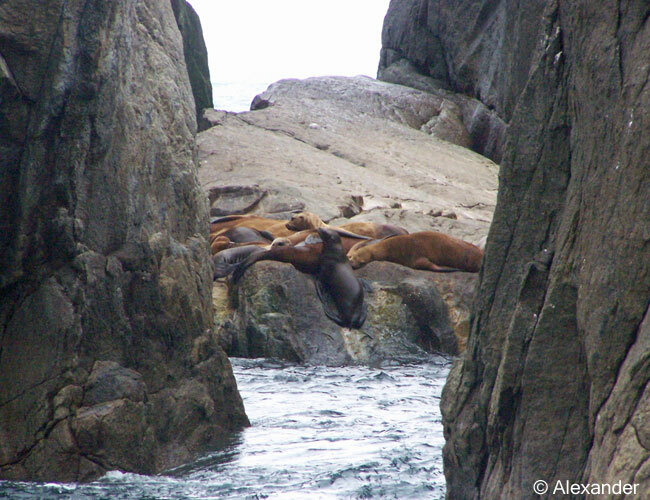 In addition, the Gulf of Alaska waters are teeming with sea lions, sea otters, humpback whales, and more. We were there in the month of August, and saw thousands of wild sea mammals and migrating birds. There in Resurrection Bay sea lions bulk up on fish, otters gorge on shellfish, migrating birds reproduce over the summer. 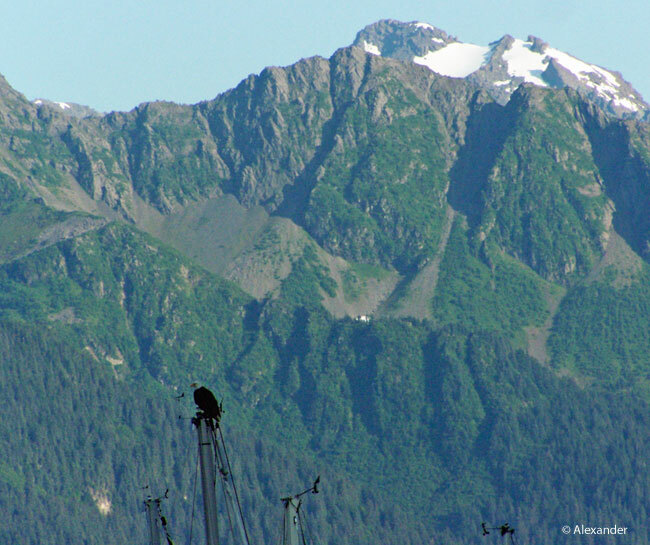 We witnessed dozens of bald eagles perched atop boat masts in the Seward marina, strategizing their next fresh catch. 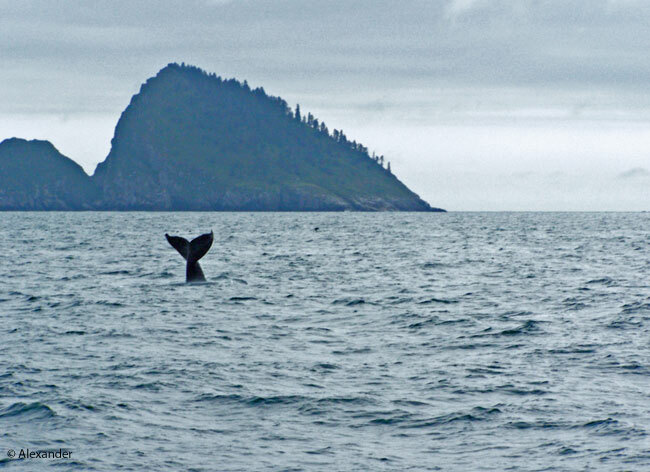 We never tired of spotting numerous humpback whales and other marine mammals and seabirds. 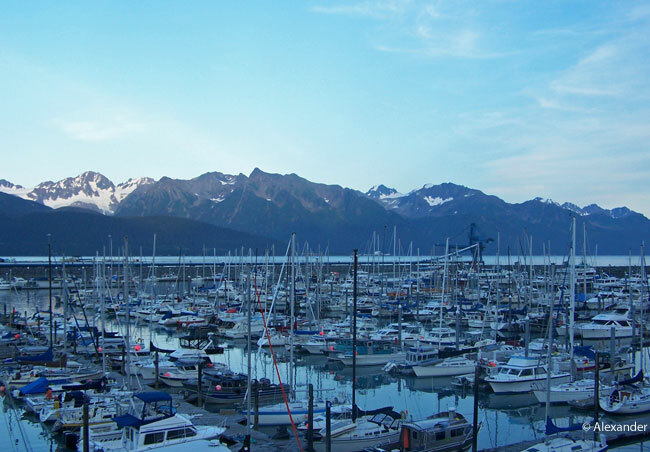 Located only 120 miles (193 km) from Anchorage, Seward can be reached by many different modes of transport. We drove the 2.5 hour trip along the Seward Highway, a National Scenic Highway. 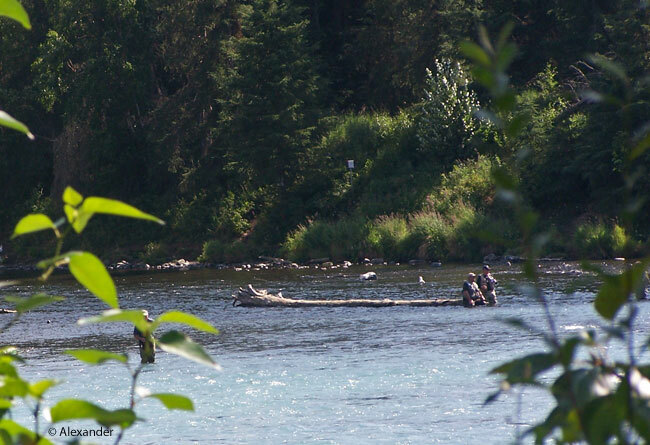 Along this highway with breathtaking vistas, we saw both moose and fishermen up to their hips in the water. As inhabitants of planet Earth, we are all so lucky to have the natural wonders of Alaska and Seward. All photos by Athena Alexander, except the photo below. How the historic Iditarod Dog Sled Race is connected to Seward. Photo by Derek and Julie Ramsey. Courtesy Wikipedia. I’m glad you enjoyed the Seward post, Freja. It is not at all like the Galapagos, but yes, it is plentiful with wildlife. Thanks so much for your visit and comment. Bountiful! That’s a great word to describe the natural treasures of the PNW. Seward is on our list for a future trip, and your words and Athena’s photographs have bumped it up. 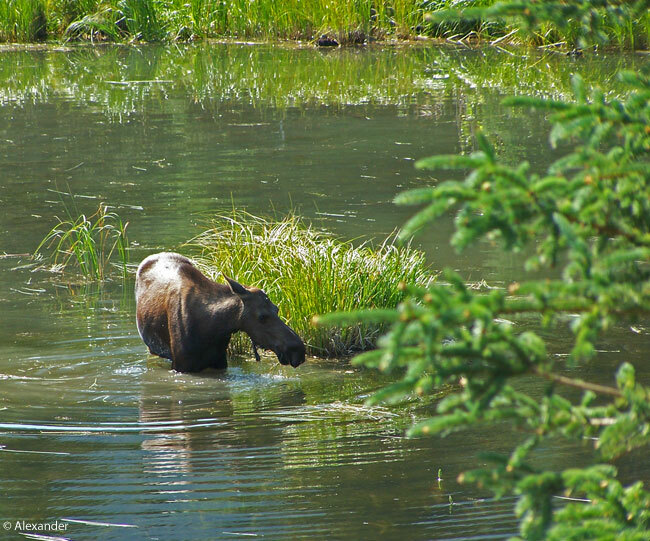 Loved the marina shot, and the beautiful moose. Thanks, Jet, and we wish you both a wonderful weekend! It is easy for me to see you and Mrs. PC in Seward, pc. There is a rugged freshness and wildness that I am pretty sure you two would enjoy. My best to you both for a wonderful weekend ahead. And, as ever, thanks so much. I’ve always wanted to visit Alaska. Thanks for enticing me with your gorgeous photographs. I always love the sea lions. Enjoy the weekend! Thanks so much, Jill. Alaska is a tricky place to visit because the cold weather and dark days are so dominant. Best time to go is June, July or August, but you have to book up early because that’s when most visitors go. I hope you get a chance to visit someday, and until then, thanks for visiting here. Such amazing and wonderful creatures! Thank you, Stacey — and thanks for stopping by and commenting. Have a pleasant weekend. Alaska is under fire right now in the Arctic, where oil drilling is going to break into pristine places. The way we can become better stewards is by opposing environmental catastrophes wherever it is possible. Because I am with you, Bill, we need to keep our magnificent places magnificent. Thanks so very much, always a delight. Your beautiful words and photos bring back wonderful memories of our Alaskan cruise in 1993. We went ashore at Seward and journeyed to Fairbanks and Denali Park. Yes, Alaska is such a beautiful place. I am happy you have had the pleasure of visiting Alaska, Allan, and am glad this post revived wonderful memories of your cruise. Thank you for your connection today, my friend. Hi Amy, I am happy you have had the delight of visiting Alaska. Though now that the digital cameras are out, you may have to revisit it. Either way, great fun. Thanks so much. What glorious captures of such wonderful memories – I so want to explore more of Alaska. Each day we get to look out our back windows to check on the snow fall on some Alaskan mountains and in-turn, Alaska occasionally shares with us some of the tsunami warnings following their quakes. Mother Nature’s reminder to NEVER take anything for granted! All those beautiful photos you take of that island and the forest and water, yes, I’d say you live where it’s as beautiful as Alaska. My warmest thanks, Joanne. What an adventurous trip. Alaska is surely one of our earth’s treasures. Thank you for sharing your trip and Athena’s photography is breath taking. There was always an adventure in Alaska. And what fun to bring you the Seward segment today, Sharon — thanks so much for your visit. I hope things are going better in SoCal now. Hi Jet, thanks for asking, yes all is calmer. Lots of recovery going on. We had rains but no damage from flooding. The local community is reaching out to the folks who need the most help. I have a beautiful day today. We are going to set up a Christmas tree! I am happy to hear this, Sharon. I know it will take years for things to settle out again, but no damage from flooding is a good start; and rain is great for clearing the air and getting the regrowth started. My warmest wishes for happy days ahead, dear Sharon. Thank you Jet, Merry Christmas. Oh! Oh! Ive been to this one, and taken the boat tour. My brother and I saw all kinds of stuff, land, sea, and air. The orca bull that swam beside us was the most impressive thing I’ve ever seen. Bunch of cows and calves swimming along… ooo, ahhh. When he showed up it looked the size of a nuclear sub compared to them, and you could tell real muscle was underneath the whale coverings. What a joy to read the excitement in your comment, Craig. You sure know how to write. How very wonderful to see an orca bull. When they swim so close to the boat it takes your breath away. And sometimes you can hear their breath. So much happening on that Gulf of Alaska. I am delighted you have great memories of this sparkling paradise. Lovely comment, my friend. You can smell them too. The humpbacks smell like a truckload of fish when they blow. I absolutely love knowing this, Craig. THAT is close! Lovely post. Very interesting to learn more about the Iditirod race, too, and the Serum Run! Beautiful photos of a beautiful place! Thank you. So glad you enjoyed the visit to Seward today, Nan. I found that little nugget of info about the Iditarod interesting too. Thank you so much, dear Nan. Such beautiful photos and you’re amazing at describing the environment! I’m glad you enjoyed the Seward post today, Dave, thank you. I remember you and Sue visited Alaska once. Knowing you two intrepid adventurers, you probably biked across the surface of the Gulf of Alaska. 😉 Many thanks for your visit, and my best to you both. Wow Jet, the adventures you get up to and the wonderful wildlife you see! Yes, it was great fun seeing all of that wildlife. Other parts of Alaska had caribou and mountain sheep and bear…just a lovely wilderness place there. Thanks so much, Bertie, always a smiling pleasure. What a visual treat. A place I’ve always wanted to visit, even more so now! Wow. That looks to be a wonderful place to visit. I especially love the shots of the moose and the whale. Thank you Mike. We were speeding down the highway when we saw the moose off the road, turned around, and got an eyeful. The whale was photographed from the boat, which is always tricky, as you know. Always a pleasure to “see” you. The sheer scale of this landscape is hard to for me to imagine. The wild beauty of Alaska is legendary, so glad it is one of our states. The scale of the landscape is nearly impossible to convey, but I am glad you were able to get a good idea of the magnificence, Eliza. Not much in the way of gardening in Alaska, with so many cold months, but beauty does abound. We took a cruise to Alaska ten years ago, but we didn’t see as many animals and birds as you did. Maybe we were too early or too late in the season. We were pretty lucky, Hien, to have spotted so much. But on that boat for instance, it was really really cold and we were the only people out on deck. So there’s quite a bit of hard-core determination going on there, too. You know how that is, because you don’t get those fantastic bird photos on the east coast in winter without being hard-core yourself. Cheers, my friend. 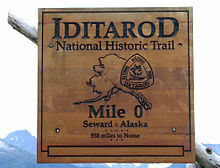 I forgot the Iditarod started out in Seward. Alaska is one place I’ve had a hankering for, but somehow never got it together to get up there. 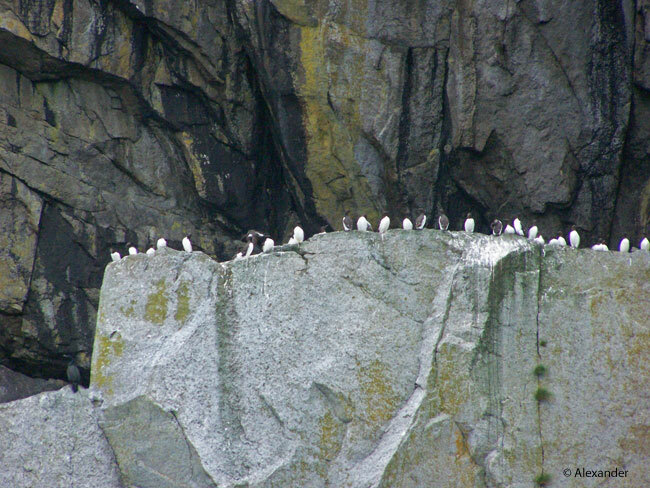 Then again, we share some of the wildlife, having colonies of Common Murres on some offshore cliffs. Moose, not so much. And, of course, even the glaciers at Mount Rainier don’t hold a candle to AK’s. Athena did a fantastic job capturing the abundant wildlife to fill add to your narrative. Don’t know if I’ll ever reach Alaska (though I am closer than you are! 😀 ), but your post certainly makes the effort more tempting! I think you have a great handle on the Pacific NW, Gunta, and both are magnificent. 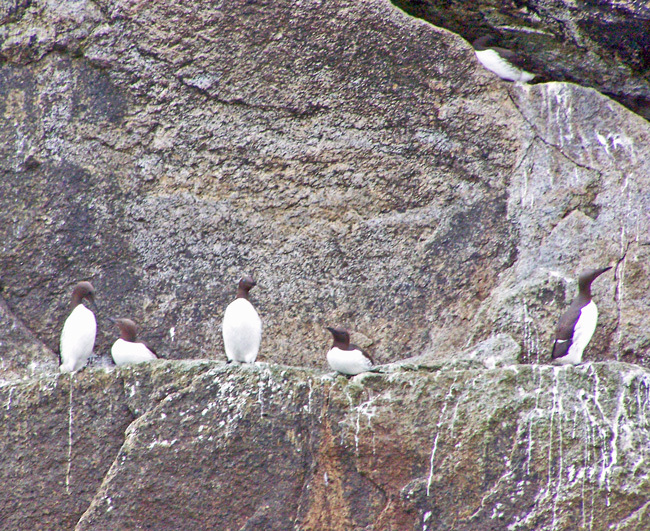 How wonderful to have colonies of common murres on offshore cliffs, and Mt. Rainier nearby. Thanks so much for visiting Alaska with me here, always a true pleasure. A joy to bring you along on the adventure, Jo, thanks for stopping by today. Alaska is a wow kind of place. I’m happy you enjoyed the post, David, thank you. I’m smiling, Alastair, because I LOVE that photo of the common murres all in a row. I like the symmetry and the size perspective, and I think a tidy line of birds as exquisite as the common murre, all in a row, is just so cool. I so enjoyed your comment, and delighted you enjoyed the visit to Seward. Always a pleasure, my friend, thank you. Your lovely pictures remind me of the fjords and scenery of Norway. Now I’ve added Kenai Fjords National Park to my bucket list. 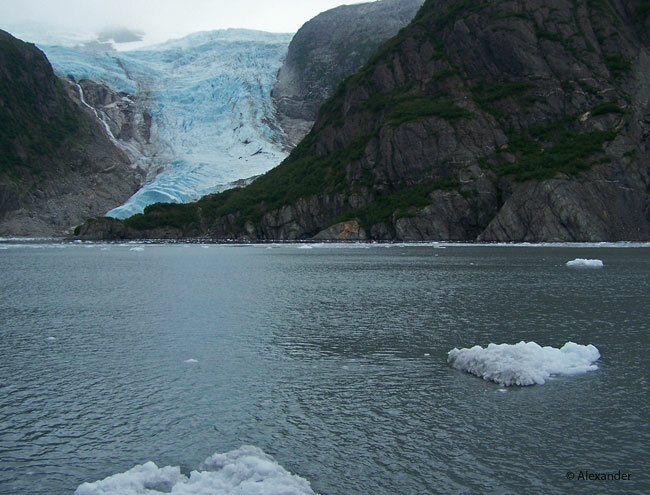 Seeing all that wildlife and watching a glacier calve ~ the half-day boat trip sounds thrilling! Yes, Barbara, the boat trip was thrilling. These were the only fjords I have been to, but I can imagine Norway must be absolutely astounding. My warm thanks for your visit and comment. Bald Eagles perched on sailboat masts…how wonderful. Your post is filled with wonders, Jet. And what a joy to share the wonders of Seward with you, Michael Stephen, thank you. Those bald eagles were great fun to watch…and there were so many! Happy to see there are still some Earthly treasures left unharmed by humankind. Witnessing wildlife romp and feed spins the heart and stirs the imagination. Thanks for presenting a look at our 49th state. Wonderful photos Jet! Dear Eddie, great fun to share our beautiful 49th state with you. And I enjoyed your words, and agree entirely…witnessing wildlife romp does spin the heart and stir the imagination. A big smile of thanks to you, my friend. Great pics….sounds incredible and the thought of driving the highway through that type of scenery really appeals to me. Bucket list for sure!! Great post as always Jet and my compliments to Athena for the pics!! It’s easy for me to picture you and your wife travelling the beautiful Seward Highway, Kirt, and capturing images and making them into colorful artwork. Thanks so much for your kind words and visit today…always appreciated. I am always fascinated with anything nature and wildlife with our State, Alaska. Thank you for sharing, Jet! …and what a huge state Alaska is. I share your fascination, Donna. Thank you! Beautiful scenery and beautiful photos. I sincerely hope that icefield will never go away! I sincerely hope that icefield will never go away, too, montucky. We do what we can, and we admire what we have while we still have it, yes? Thanks so much for stopping by and commenting, I always enjoy your visits here. Beautiful. I find that often the places where there are fewer people are the most beautiful (not messed up yet). I am with you on that, Anneli. Glad you enjoyed this visit to Seward. Many thanks for your visit. Alaska is on my bucket list. Glad you got a shot of the moose. 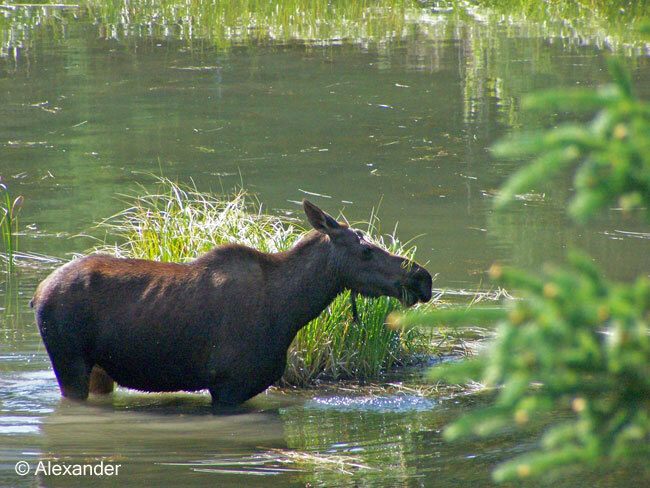 We were thrilled to get a photo of that beautiful cow moose enjoying the grass, glad you enjoyed it, Sherry. Thanks very much. I was there in 1999. A treat to share the beauties of Seward with you, David, and how wonderful that you experienced the joys of Alaska. My warm thanks for your visit and happy words. So kind, your words, Frank — thanks so much. A pleasure to have you stop by. If you were ever to go Alaska, Andrea, I would suggest you go first to Denali National Park. Seward and the Kenai Peninsula could come next. But having only been there once, for two weeks, I am not an expert. In the meantime, I am happy I could supply you with this visit. Always a joy to exchange with you, Andrea, thank you. It all looks so incredible. Wow what a treat to see so much wildlife in its natural habitat. And the glaciers are so dramatic. I would love to go to Alaska one day. What an incredible post. I do love the moose in up to his belly. I have to admit to never having seen a moose!! Water buffalo yes, but moose, no. Thanks for giving us a little taste of Alaskan wildlife. I find moose delightful and exotic too, Peta. The first one I ever saw in the wild was a female on the trail in a forest near Anchorage. She was so tall! Of course we walked around her, and she quietly grazed. And I agree with you, the glaciers are indeed so dramatic. Glad you enjoyed the visit to Alaska, and as always, thanks so much for your visit. Thank you, Carol — glad you enjoyed the visit to Seward. I am happy to know I could express the bounty of Seward with you, Val. It is, as you say, a heart-warming experience to know there are rich, natural environments here on our planet. A joy to “see” you, thank you. 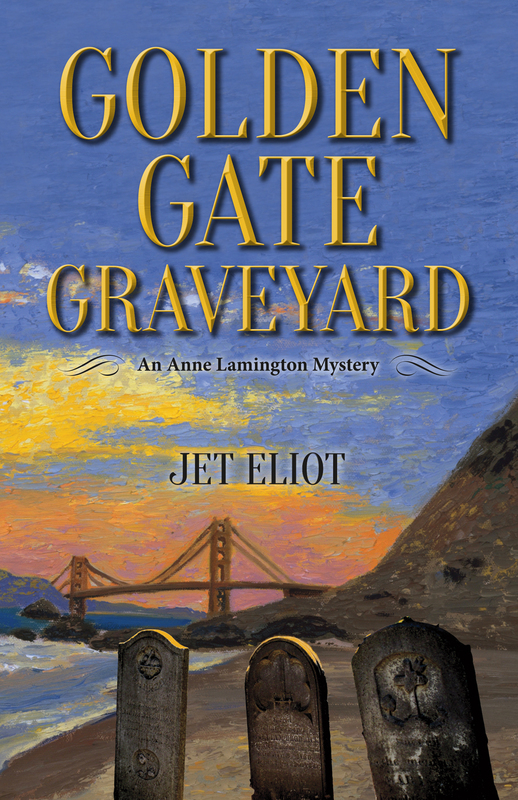 Thank you for the wonderful article, Jet. 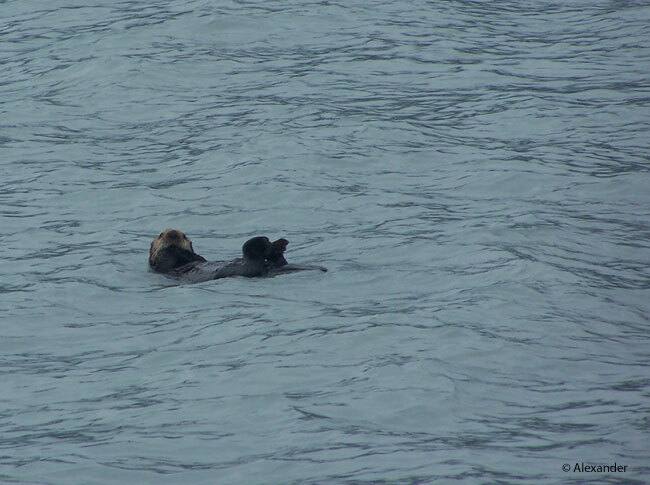 I am so delighted to learn about the abundance of wild life in Seward, Alaska. Hope it stays this way. Thank you again for the beautiful photographs and information. Always a pleasure, Inese, to share the beauties of the world with you. Thanks for your visits today, much appreciated. I was lucky enough to cruise Glacier Bay, which of course isn’t that far away from the spots you show here. We sailed from Hawaii on a 65′ sailboat — a ten day passage — and then had several days to poke around in some of the most beautiful country I’ve ever seen. 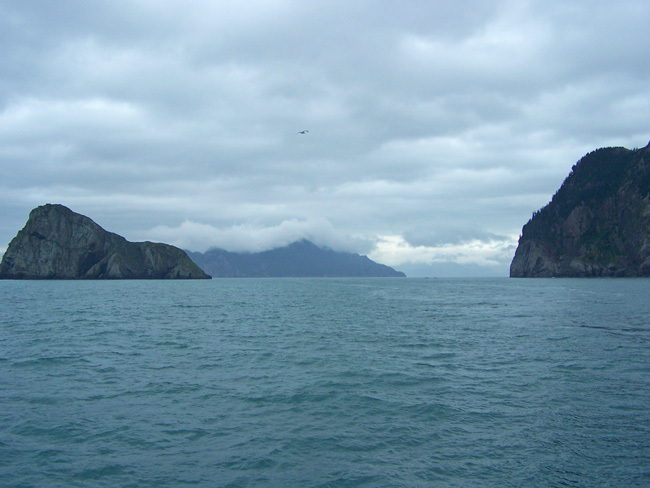 There were no digital cameras then, but I do have photos, both from the ocean passage and from Glacier Bay. You certainly have stirred some memories. With luck, and effort, that pristine wilderness can be preserved for the pleasure of others. Some of these Alaska scenes remind me of similar-looking ones in another—and distant—part of the Ring of Fire: New Zealand. Your mention of the Ring of Fire is well-received and appreciated, Steve. The fjords especially ring of New Zealand. I love how connected our whole planet is, and enjoyed this comment, thank you. Thanks so much, Jess T.
What a gorgeous place! Your post has definitely inspired me to move Seward (and Kenai Fjords National Park) up near the top of my “must visit” list. We befriended a delightful family from Seward while traveling through Utah this fall, so I have another excuse to make the trip. The more we travel, the more we want to travel. Enjoyed your visits today, Marsi, thank you. I’m glad I could share the beauties of Seward until you can get there, Katy. Thanks so much for your visits and comments, much appreciated. I’ve had a blast on Your blog! Leaving with very happy heart and eyes! Thank You! 🙂 You and so many people I know have gone to Alaska. It seems like a magical otherworld. We love watching all those Alaska shows on Discovery. Even if they are scripted. We don’t care. 😂 It’s just SOOO beautiful! I am delighted you enjoyed looking around my blog, Katy. And what a joy for me to hear you had a happy heart and eyes from it. You always bring a smile to my face, thank you. Awesome photos of beautiful Alaska. Thank you, Leola, for stopping by and commenting. I’m glad you enjoyed this look at Seward. I did….My dream is that one day I’ll be able to visit Alaska. A fascinating look at these majestic places, Jet. Thanks for sharing the very informative ‘travelogue’ and breathtaking beauty! Funny…. just the other day I happened to be reading about the origins of the Iditarod, and today saw your very interesting link – thank you! The origins of the Iditarod are very interesting, I’m glad you found my post while you were learning about it. Always a joy to have you stop by, BJ. Thank you, histrionicnature, it’s not easy to get common murres, I’m glad you enjoyed the photo. Thanks for stopping by.